Bouncer Depot has recently announced the release of their new game. This game is called inflatable axe throwing game and it is a great choice for party rental businesses to keep the attendees hooked for long hours. Los Angeles, CA, March 21, 2019 --(PR.com)-- Bouncer Depot has come up with an all new game that has already been creating quite a lot of buzz. It is called inflatable axe throwing game. As Bouncer Depot is a direct manufacturer of commercial grade inflatables, one can rest assured that the quality of the items in it is top notch. The main target segment for this business has to be those who are in the line of party rentals as they can benefit immensely by this game. 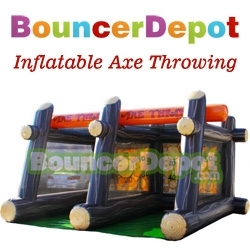 The inflatable axe throwing game mainly consists of two inflatable axes along with blowers and tarps. All the things required for setting up this game are a part of the package. In order to play this game, two players should stand across from each other and they need to throw the inflatable axe into the circle. The smaller the circle; the more points one can win. Whoever wins the most number of points before time runs out would be adjudged as the winner. Those who are in the line of party rental businesses know the importance of finding some innovative and unique games like these. When they land upon the kind of games which can help them keep the attendees hooked and entertained, it serves their purpose and can help in making a party successful too. With this game, party rentals can inject buzz and excitement in a party as it stirs a duel and competitive spirit of sorts without creating too much fuss whatsoever. One can play this game both indoors and outdoors. Rental businesses can make the most out of such games as they can have it set up in no time. At the same time, it can keep a lot of people hooked too. So, all party rental businesses looking for new ideas and ways to make a party engaging and happening should definitely explore the details of such games. Bouncer Depot surely came up with an amazing concept which has helped them win the right support among buyers and party rental businesses. Not just rental businesses but also people who love to set up games and play in their backyard in the weekend can make the most of it.